This is the last of my shortbread series, if you hadn’t already figured out that I was doing that. I actually just figured it out this morning. I don’t think I have ever made more shortbread in a short period of time. I have to say, I really did love all of them, but this one in particular was my favorite. So even though my older daughter is not writing this post, this is all her. I love to watch her grow, and hope that maybe I have rubbed off on her, at least my positive attributes that is. 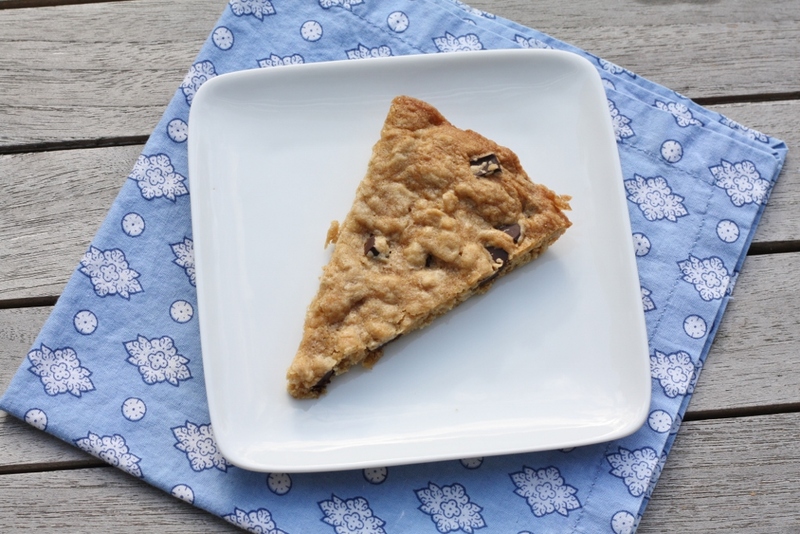 People often ask what I do with all the stuff that I bake – especially because my husband can’t eat most of it (needs to be dairy-free) – well, for the most part I bake for my kids, my neighbors, and for any event I possibly can. Basically I look for any excuse to bake something. Well, I am seeing my daughter follow the same pattern. The other week she came downstairs and asked if she could bake something. I asked her why, and she told me that she met a 1st grader on the bus this year, and she really wanted to bring her cookies. I couldn’t believe how sweet that was. My daughter was her “5th grade buddy” on the bus – basically she looked out for her, and made sure she was ok. I was so proud. I told her to look through her books and find something she could make all by herself. Mix the first four ingredients with a mixer until a ball has formed. Carefully mix in the shaved chocolate. Place dough on a counter, and separate dough in half. Gather dough into a ball, and flatten into a disk. Repeat with remaining dough. Chill in the refrigerator for about 30 minutes. Grease two 9″ pie plates. Press dough into the pie plates until flat. Bake at 400° for 10-12 minutes or until golden brown. Cool on wire racks. I swear July has seemed like the longest month ever. It is strange – it has been amazingly beautiful here, the nicest summer I can ever remember (in 17 years! ), I have made it to the Farmer’s Market every Saturday, and I have gotten some good cooking time in on the weekends (ok, bare minimum of what I find acceptable). Aside from my frantic work weeks, and the fact that most nights I head home just completely stressed out – ok, maybe that’s why it has been a long month… I am looking forward to August – looking forward to maybe getting a break, and maybe (just maybe), working on getting my piles of recipes down to a respectable size. I love pistachios – they are hands down my favorite nut out there. I love when I crack open the shells, and find a really green one – and I love even more when I buy the pre-shelled pistachios from Trader Joes. Boy are those dangerous. Opening up the shells actually slows you down a bit – but when you can pop a whole handful in your mouth at once…they can definitely go quickly. I remember seeing this recipe in Bon Appetit and imagining exactly how these would taste. I was very strategic though on when I made them – I wanted to make sure I knew what to do with the entire bag of pre-shelled pistachios, before I ate myself sick. The weekend finally came along and I had 2 different recipes with pistachios all set and ready. I snuck a few in my mouth here and there, but I was good – and had plenty to make both desserts. 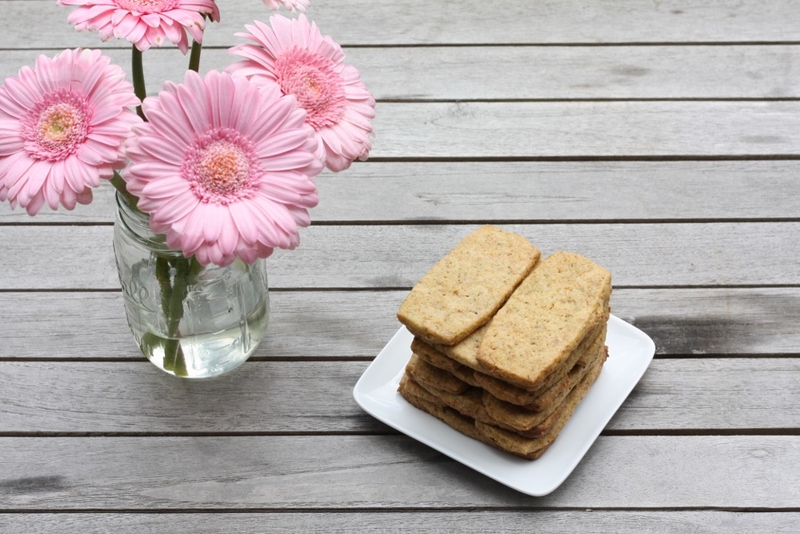 These shortbread were fantastic – maybe even the best I have made yet. They were crunchy and buttery and that was before I even brought out the strawberry jam. 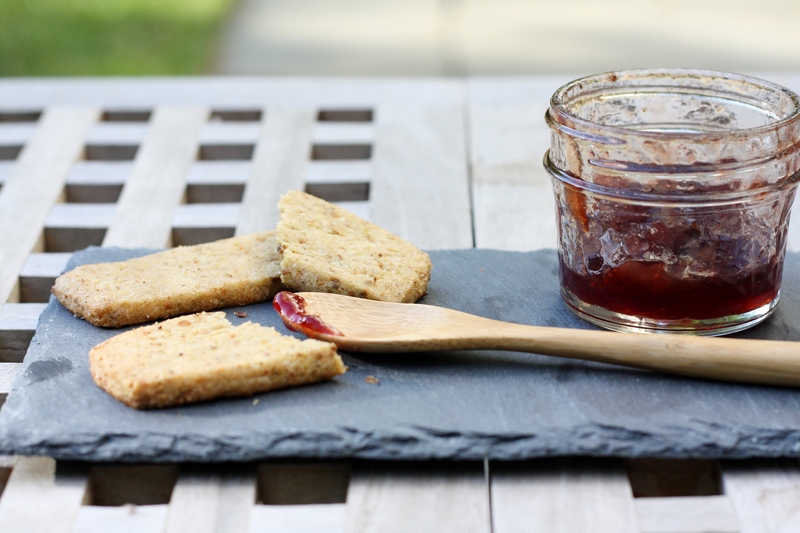 Once the jam came out – it took them to an entire different level – a level that I have not experienced with shortbread before. Wow, what a treat. As we end July – I want to remind everyone that summer is not over yet – and it is not too late to get out there and have some fun in the sun. And for those who are like me, there are still plenty of long days left to make lots more jam. In fact – maybe that’s exactly what I need to start doing after work – how’s that for a stress reliever? Uh oh, I am starting to think I am the best nut out there. Pulse pistachios in a food processor until finely ground but not a paste, about 30 seconds. Add flour, sugar, butter, salt, and vanilla; pulse until mixture is the consistency of cornmeal. With machine running, drizzle in 2 tablespoons ice water (a crumbly dough should form; do not over process). Transfer dough to a sheet of parchment paper and pat into a rectangle. Top with another sheet of parchment and roll out to a 12×8-inch rectangle. Transfer dough (in parchment paper) to a baking sheet and chill until firm, about 1 hour. Place racks in upper and lower thirds of oven; preheat to 350°. Remove top sheet of parchment paper from dough and discard. Cut dough lengthwise into 8 equal strips, then each strip crosswise into quarters, forming 32 rectangles. Place rectangles on 2 parchment-lined baking sheets, spacing 1-inch apart. Bake shortbread until golden brown, rotating sheets halfway through, 18-20 minutes. Transfer to wire racks; let cool. DO AHEAD: Shortbread can be made 5 days ahead. Store airtight at room temperature. It’s jam time…that’s right, one of my very favorite times of the year. The time of year when those empty shelves in my pantry start getting filled with all sorts of delicious cooked fruit. My daughters love that I make jam, in fact my younger daughter refuses to eat any other jam except my homemade. You could say I have spoiled them, or maybe just taught them what good food is. 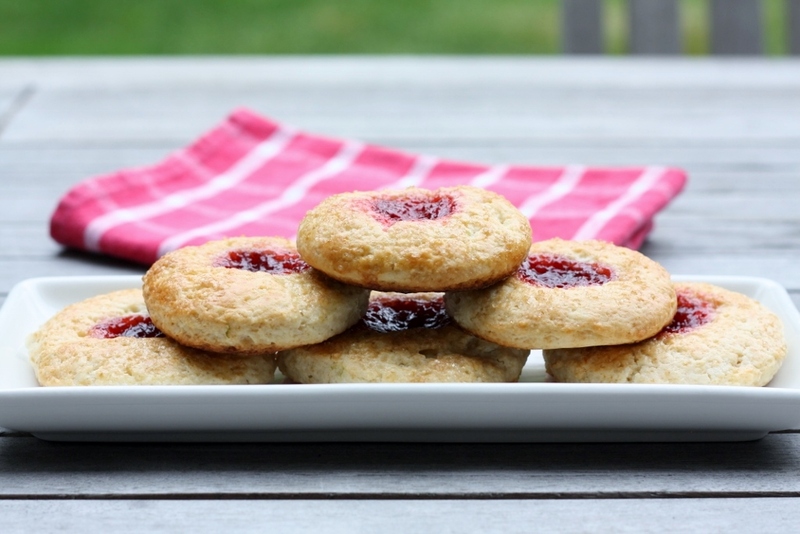 Back to this recipe…I found this in Bon Appetit, and I felt like it was time to actually bake with some jam. 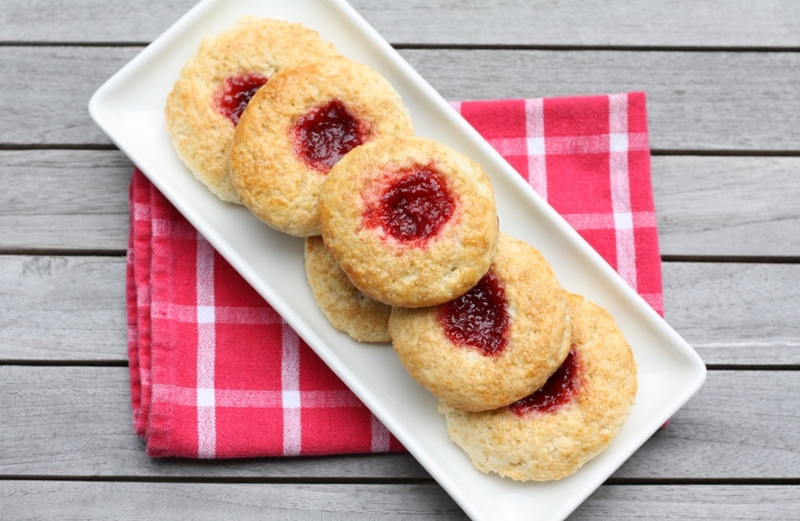 These were so perfect for strawberry season – just the right amount of sweetness with the biscuit – the girls ate them every morning before swim team, and they were gone in no time. Fortunately there is still some of that great leftover jam in the refrigerator…I just need to get a label for the jar, and it will disappear magically, so I am told. Cook strawberries and sugar in a medium saucepan over medium-high heat, stirring occasionally, until jamlike in consistency, 12–15 minutes. Remove from heat; stir in lime zest and juice. Pour into a shallow bowl and let cool. Preheat oven to 400°. Whisk sugar, baking powder, salt, and 2 1/4 cups flour in a large bowl. Add butter and lime zest and blend with your fingertips until coarse crumbs form. Add buttermilk and, using a fork, mix until just combined. Transfer to a lightly floured surface. Gently knead just until a shaggy, moist dough forms, about 4 times. Roll out dough about 1/2-inch thick. Using a 2 1/2-inch biscuit cutter or inverted glass, cut out rounds. Gather scraps and repeat rolling and cutting until all dough is used. Place biscuits on a parchment-lined baking sheet. Using your thumb, make a large divot in the center of each biscuit; brush with egg and sprinkle liberally with raw sugar. Spoon a scant 1 teaspoon strawberry jam into each divot. DO AHEAD: Jam can be made 3 days ahead. Cover and chill. Summer came and hit us all in the head this weekend – I must say, there wasn’t much of a Junuary this year, which is a good thing, and a bad thing. Of course we had our share of rainy days, but nothing like our normal kick-off to summer vacation. I am sitting here typing at almost 8pm, sweating bullets in my non-air conditioned home, where the temperature on the thermostat is reading 83 degrees (and that is on the main floor, it is hotter upstairs). Ok, yes, I am officially a wimp. After almost 18 years in Seattle – I have forgotten what it is like to live with hot weather. The funny thing is each summer when we travel back-east for the summer grandparent tour – if it is not in the 90s, I am disappointed. But I am usually on vacation at that time, and most places have AC…unlike here. Last night my husband and I had a date night – it was the first in many weeks, and we were really looking forward to it. 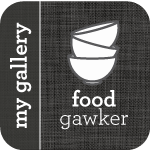 We decided to try a new place – a new restaurant opened by a Chef/Restaurateur that we really love – it got a lot of local hype, and the space and menu looked amazing. The space was even more beautiful in person, really high ceilings, more of a modern rustic feel, and extremely bright – but when we got there our table wasn’t ready so we decided to sit at the bar. This was actually the highlight of our meal. The bartender did a really nice job with the drinks – the bar was not extensive, which again proves, you don’t need a lot to make really good drinks. The problem was the bar stools were too low – and the counter came up to my upper chest. I felt like a kid. If it wasn’t for that, we probably would have just eaten at the bar (which is definitely something we love to do), but I didn’t think I could comfortably eat my meal – so we waited for our table to be ready. 45 minutes after our reservation, they finally sat us. If we were not paying for a babysitter, it probably would have been fine – but the one drink they took off the bill, didn’t really make it even. The biggest disappointment was the food – although it tasted good, it was not noteworthy – I would rather eat my husband’s chicken on the egg any day of the week – and the pork he had was fine, but nothing to write home about. Even though we had 2 appetizers and 2 main courses, we were still hungry at the end of the meal. At that point we were both sweating – there was no air-conditioning (which is not uncommon), and the delay in getting our table and the slow service afterwards just made things a bit worse. There was no way we were waiting for dessert – especially when the 3 choices didn’t really appeal to us. So, what is the best dessert for a hot summer’s night – what would have actually gotten me to sit there longer and endure the heat and slow service? Definitely these ice-cream sandwiches from Bon Appetit. 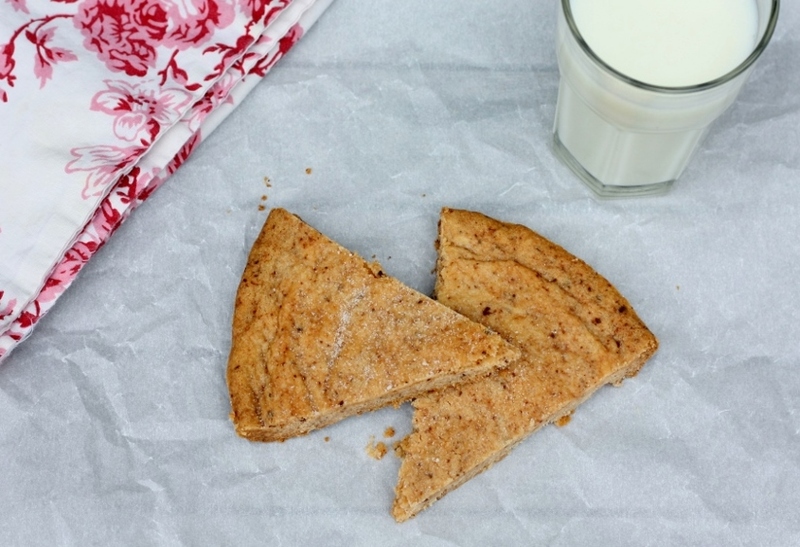 We changed the recipe slightly to appeal to our cinnamon loving tastes – and all I can say is WOW. 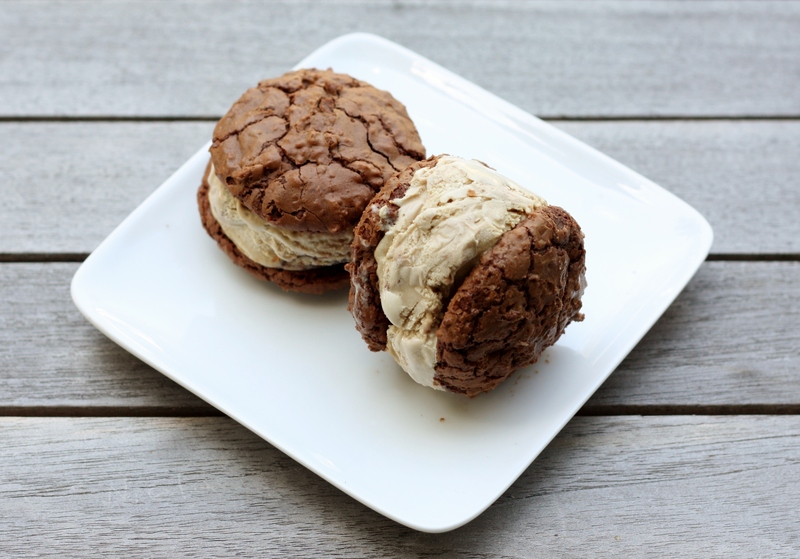 The cookies are on the softer side, so they are perfect for ice-cream sandwiches, and that coffee ice-cream with that chocolate and cinnamon cookie, it is exactly what this summer weather needs. Who needs air-conditioning when you can cool off with a summer treat like these. Arrange racks in upper and lower thirds of oven; preheat to 325°. Line 2 large baking sheets with parchment paper. Combine chocolate and butter in a medium heatproof bowl; set over a medium saucepan of simmering water. Stir until chocolate is melted and mixture is smooth. Combine almonds, flour, baking powder, salt, and cinnamon in a food processor. Pulse until almonds are finely ground. Using an electric mixer, beat eggs, sugar, and vanilla in a medium bowl until pale and fluffy, 3–4 minutes. Add chocolate mixture in 3 additions, mixing well between additions. With motor running, gradually add dry ingredients; mix well. Scoop out a rounded tablespoonful of dough. Use another spoon to help push dough onto a prepared baking sheet. Repeat with remaining dough to make 27 more portions, dividing between sheets and spacing dough 1-inch apart. Bake, rotating sheets halfway through, until tops begin to crack and cookies are set, 12–14 minutes (don’t overcook; cookies will firm up as they cool). Transfer cookies to wire racks and let cool completely. DO AHEAD: Cookies can be made 3 days ahead. Store airtight at room temperature. Place a large scoop of ice cream on flat side of 1 cookie. Top with another cookie, flat side down; press down lightly. Freeze on a baking sheet while preparing remaining sandwiches. Repeat with remaining cookies and ice cream. DO AHEAD: Ice cream sandwiches can be made 30 minutes ahead. Keep frozen until ready to serve. Change is good – sometimes it is hard, but in the end, it helps us grow and learn. I actually look forward to change – most of the time. There are facets of my life that need to be in a constant state of change, and others that need to hold steady. For example – I have some friends that feel the need to rearrange the furniture in their homes all the time. I never know just where the couch is going to be when I enter the living room. That would drive me nuts. Fortunately for my husband, I like to place the furniture once – and unless I have a really good reason – I leave it there. It’s funny, last summer I decided to rearrange the outside furniture – it had to be done. The girls came outside, and my younger one actually started crying. Too much change is hard…good thing she eventually got used to it, just like I told her she would. At work, I need change. I am always looking for the next shake-up. It actually keeps things interesting – because I have a history of getting bored pretty easily. Fortunately I work at the right company, because things are always changing. You just have to blink, and everything turns upside down. We use the word agile a lot – I love that word, it is a delicate version of the word change. It makes it seem elegant, in a very smooth way. I’m sure the next time one of my daughters throws a fit about things being off – if I ask them to be agile, they will instantly calm down. Another part of my life that needs constant change – is food. I almost never make the same dish twice – and if I do, it is an exceptional recipe. Last night I made refrigerator casserole – I just took everything from the refrigerator that I had to use up – put it into a pan with some rice, and made a delicious meal. My husband loved it – and asked if we would ever have it again. I laughed. 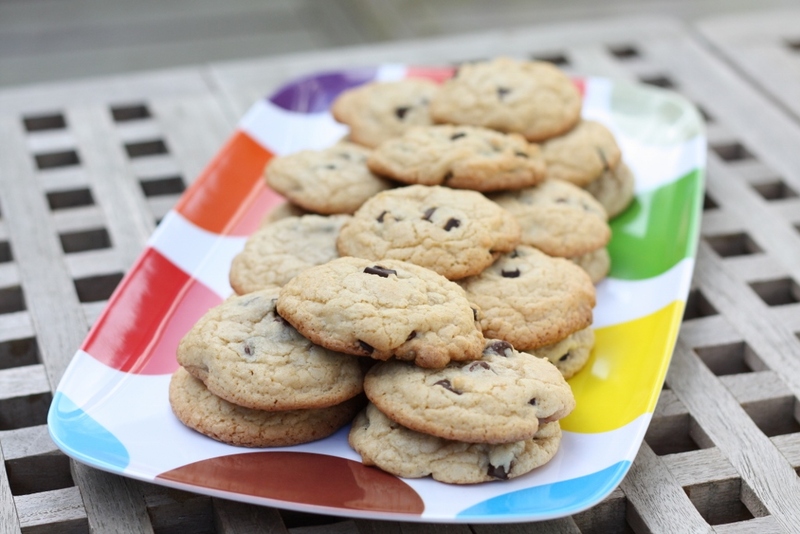 Chocolate chip cookies are a staple – yet I always seem to find one more version that I have to try. This recipe from Cooking Light was no exception. Brown butter…now seriously, how can that be anything but amazing? 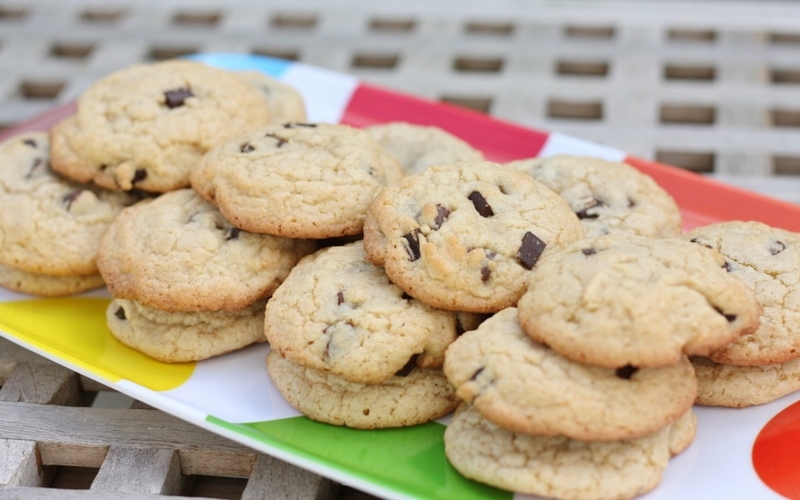 Let me tell you – these were just about the best chocolate chip cookies I have ever made. Let alone the fact that one of these babies had less than 100 calories a piece. I promise you these will be made again – that is until I find an even better recipe. So – go change something in your life – not everything, but try for something new every day. It will keep you on your toes – and you might even end up with something better than you started with. What a novel idea. Preheat oven to 375°. Heat butter in a small saucepan over medium heat; cook 5 minutes or until browned. Remove from heat; add oil. Set aside to cool. Weigh or lightly spoon flours into dry measuring cups; level with a knife. Combine flours, baking powder, and salt, stirring with a whisk. Place butter mixture and sugars in a large bowl; beat with a mixer at medium speed until combined. Add vanilla and eggs; beat until well blended. Add flour mixture, beating at low speed until just combined. Stir in chocolate chips. 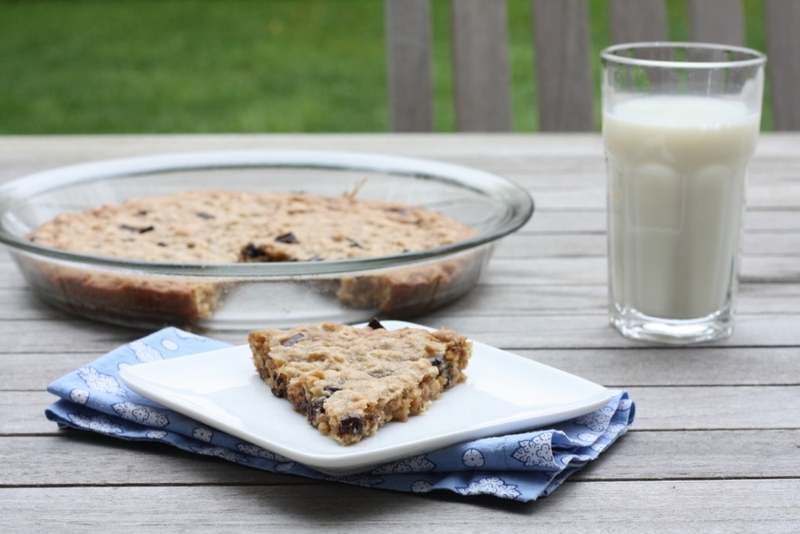 Drop by level tablespoonfuls 2 inches apart onto baking sheets lined with parchment paper. Bake 12 minutes or until bottoms of cookies just begin to brown. Cool slightly. There are so many different words to describe a good “spiced” treat. Of course the obvious is just to use the word “spice” – like spice cookies or spice cake. 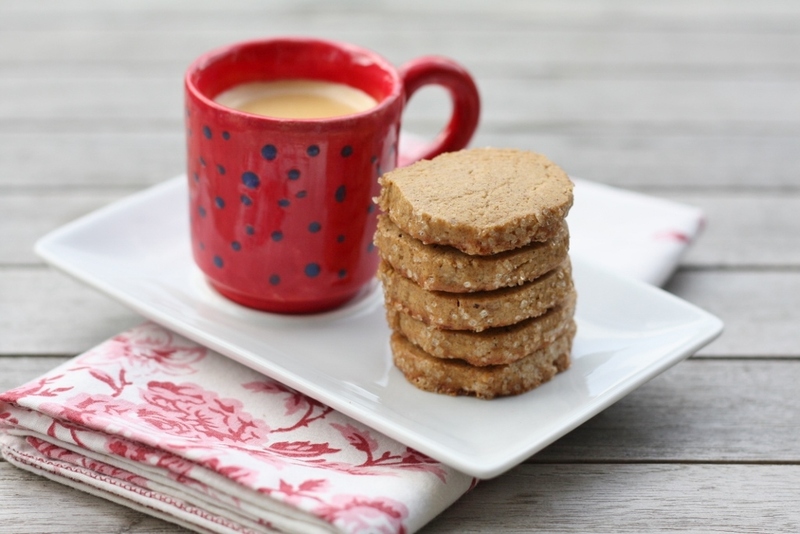 Of course, then there is the word “ginger” – which is my favorite (gingerbread) – and then came speculoos. A few years ago, I was visiting my cousins in Belgium. They were living there for a couple of years right after they got married. What a way to start a life together! Well, they took me to their favorite chocolate shop. This place was amazing. The chocolates were not only delicious, they were spectacular looking – like a piece of art. I remember looking at the different types, and one of them was “speculoos.” I asked them what that was, and both their eyes just rolled backwards – they loved that type. They explained to me that it was cinnamon ginger spice. That was the first time I had heard that word, but I guess it is pretty common, I then found a speculoos flavored macaroon, and some ice cream on the same trip. It was so odd that I travelled all over Europe as a college student, but never encountered that word then. Fast forward a few months, and I was reading emails on our company’s internal alias for “Food and Wine Enthusiasts” – and someone was looking for those “Biscoff” cookies that Delta Airlines carries on certain flights. I didn’t realize they were such a hot commodity. That conversation quickly turned to the “speculoos spread” – basically a spice spread, with a similar consistency to peanut butter. Who knew they actually carried it at Trader Joes! I swear this speculoos thing has almost a cult following! A few months ago I was reading my Bon Appetit, and came across this recipe. I almost went to the kitchen right then and there – but I had a lot going on so decided to save it for another time. That time finally came – and you know why? I was looking for a cookie that I could give my new mommy friends with their Shepherd’s Pie – something that could sit in the freezer until they were craving something sweet – almost like a roll of Pillsbury cookie dough. When I saw that these cookies made three rolls – it was too good to be true. One roll for each of my friends, and one roll for me… OMG – AMAZING!!!! First of all, the smell that these cookies give your house – just the perfect fall/holiday smell – ok, it is March, but who doesn’t love their house smelling like that? They tasted great – not too sweet, but just sweet enough. You can’t just stop at one. So – I thought it was only fitting to post these tonight – as I sit hear waiting for my Delta flight – where I am sure I will get some of those Biscoff cookies. Seriously though, those are good – but these mean business. Everyone should have a roll waiting for them, without having to get on an airplane. Whisk first 6 ingredients in a medium bowl; set aside. Using an electric mixer at medium speed, beat butter in a medium bowl until smooth, about 2 minutes. Add both sugars and molasses; continue to beat until mixture is smooth and creamy, about 3 minutes. Beat in egg and vanilla; mix for 2 minutes. Reduce speed to low; add dry ingredients and mix to blend well. DO AHEAD: Dough can be made up to 2 months ahead. Keep frozen. Whisk egg white in a small bowl to loosen; lightly brush all over 1 log. Sprinkle with (or roll in) sanding sugar. Using a long, slender knife, slice off a sliver of dough from each end of log to make ends flat. Cut log into 1/4 inch-thick rounds. Transfer to 1 baking sheet, spacing 1/2 inch apart; place in freezer while you cut the next log. (The cookies hold their shape better if you bake when dough is cold.) Repeat with remaining dough. Bake 2 sheets of cookies, rotating the sheets from top to bottom and front to back after 6 minutes, until tops are golden brown and centers are almost firm, 11-13 minutes. Transfer cookies to wire racks and let cool. Repeat with third sheet of cookies. DO AHEAD: Cookies can be baked 2 days ahead. Store airtight at room temperature.